The State Budget has a direct impact on the education we are able to provide our students in Worthington. 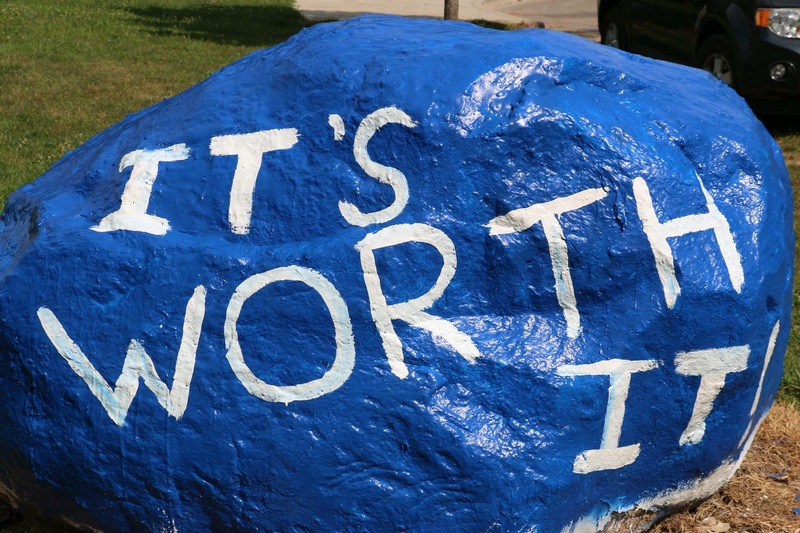 It’s very important, and because our Board of Education believes “It’s Worth It” at tonight’s Worthington Board of Education meeting (7:30 P.M. at the Worthington Education Center, 200 E. Wilson Bridge Road) the board will meet with David Leland representing the 22nd House district and Mike Duffy representing the 21st Ohio House District to discuss the recently passed State budget. Tonight’s meeting will be to review the State budget and discuss the philosophy behind it with our representatives. In Worthington recent decisions at the Statehouse have not been kind to our community. For instance our Treasurer Jeff McCuen reports that in 2006 Worthington received a net of 29.8 million dollars per year from the State of Ohio. In 2017 our net will only be 21.2 million dollars. Thus eleven years later Worthington will receive 8.6 million dollars less per year than this community used to. As a result of these state level decisions the local residential taxpayer now pays for 51% of the school district budget. In 2006 this number was only 41%. Both the state and businesses are paying less than they did in 2006. As a school district this continual shift towards asking more of the local residential taxpayer concerns us. In addition, the expansion of school choice with funds coming from the local district is also concerning. When the State Budget was passed several news agencies reported that districts would be held harmless and not receive less money from that State. But, those articles did not address the full extent of the loss. In addition to the loss of tangible personal property tax reimbursements, the budget also increases the tuition for autism scholarships, Jon Peterson scholarships and Ed Choice scholarships. A back-of-the-napkin calculation shows that the increase alone will cost Worthington Schools over a million dollars for the biennium. 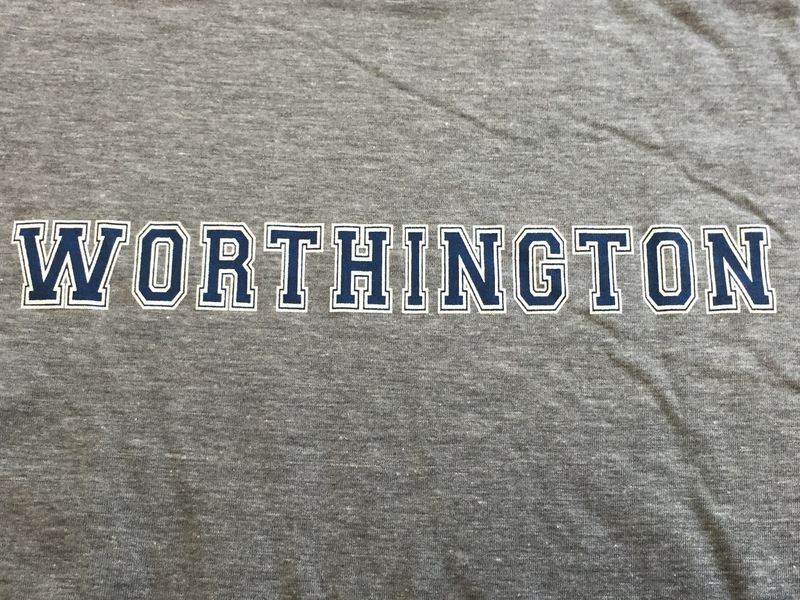 Tonight our Worthington Board of Education will discuss several resolutions that they believe are necessary to protect funding for Worthington Schools. The full resolutions can be found here on pages 8-10. Please consider attending our meeting this evening and adding your voice to the discussion on school funding for Worthington. Happy First Day of School, Worthington! Today the class of 2016 begins their senior year, the class of 2021 heads to middle school, and we welcome the kindergarten class which will be the class of 2028. Our students will be decked out today in new shoes, clean backpacks and nicely packed lunches. This may be the only day of the year when this is true. As the Superintendent of Schools I am excited to welcome the approximately 9,700 students we expect this school year. Our teachers and support staff have worked hard and they’re ready to make this a great school year. Our goal this year is to make sure every single child in Worthington knows that they have a trusted adult or many trusted adults in their school who know them and believe in their ability to be successful. We’ll be setting high expectations for every child and as a district we will commit to helping each child meet those high expectations. As a parent I’m trusting the school district with the most important people in my life. I’m sending the best I have. This year I do so with mixed emotions. I’m not quite ready to be the parent of a middle school student and it reminded me that time really does move incredibly quickly. When I was an elementary principal in Marysville one of the best teachers I know, Lara Cordell, used to read this poem to her incoming kindergarten parents every year. As we send our kids back to school today I’ll share it with you. Why, look at you now you’re already five. That just yesterday you were home with me. Because the next time, I’ll be seeing a man. Graduation day for the class of 2016 is May 29th. Have a great school year! School starts in Worthington one week from today (8.19.15)! That means that all across Worthington elementary students and parents have been examining class lists with a fine tooth comb to determine which students were grouped with which teacher, and how many students are in a class. Inevitably this creates questions regarding the number of students in each class. Sometimes it’s the teacher who is asking the questions! Our district office manages student enrollment and sectioning of classes. It is an ever changing landscape and is always difficult to manage. At the elementary level determining how many students to put in a class is both very easy, and very difficult. We have BOE guidelines IHB-R for class size averages and those guide our thought process. But in the simplest form the number of students in a grade level is divided by the number of teachers and classrooms available in that grade level at that particular school. If there are 75 first grade students and there are 3 teachers and 3 classrooms available, there will be 25 students in each class. If there is an empty classroom in the school a decision needs to be made. Should we add a first grade teacher and reduce the class size to 19 per class, or should those resources go somewhere else with greater need? In Worthington you often will see disparities between the class sizes by building. This is a function of having K-6 elementary schools and small groups of students at each grade level. When there are only three teachers per grade level at each school the students don’t often come in neat packages that divide easily. If we had larger elementary schools, or leveled schools (K-3, 4-6), you would have 6 or 7 teachers per grade level and class sizes more easily equalized. For example Granby and Liberty have 6th grade classes that average 28 and 20. If they were combined and not in separate schools the average class size would be 22.6. However, in Worthington we value our K-6 elementary schools and the strong connection and community they provide. Unfortunately a byproduct of this system is inequities in class size. Sometimes your group is the low group, sometimes the high group. Likewise, every year we deal with grade levels at school where we do not feel we can add any more students. When this happens and a new family moves in we use a process we call “overflow.” When a student is “overflowed” they are bused to a school other than their home school where there is more space. A few years ago we were overflowing over 100 elementary students each year. In response to this number of overflow students we made a decision to try to limit overflow and keep students in their home schools whenever possible. In doing this we valued keeping a family in their home school over keeping class size down or equal. Therefore where we may have overflowed students in the past when we got to number 23 or 24 in primary classrooms we are now keeping those students in their home school and going up to 26 students in a class to do so. Obviously we are prioritizing keeping kids in their home school over small class sizes. A couple more points…. The classes of 28 (4th grade) and 28 (6th grade) are both in schools where the divisor is only 2. If we had a classroom we could decide to take the 59 kids and put them in 3 classes of 19.6 or the 56 and put them in 3 classes of 18.6. This may or may not make sense, but in any case there is no regular classroom available for that choice to be made. Finally, while we all feel better with a smaller class size, (as a parent I do as well) we have seen no correlations between student growth or achievement data and class size. Our students in smaller classes are not scoring higher than our students in larger classes. Therefore, when faced with the choice of lowering class size, or providing more leveled literacy intervention to students who need help, or adding an AP course at the high school, we have typically chosen one of the later options. As we begin a new year the questions on class sizes and equity are inevitable. We may not be able to answer those questions to the satisfaction of all stakeholders, but we do commit to make certain that every Worthington student will receive an outstanding education regardless of the size of their homeroom class. 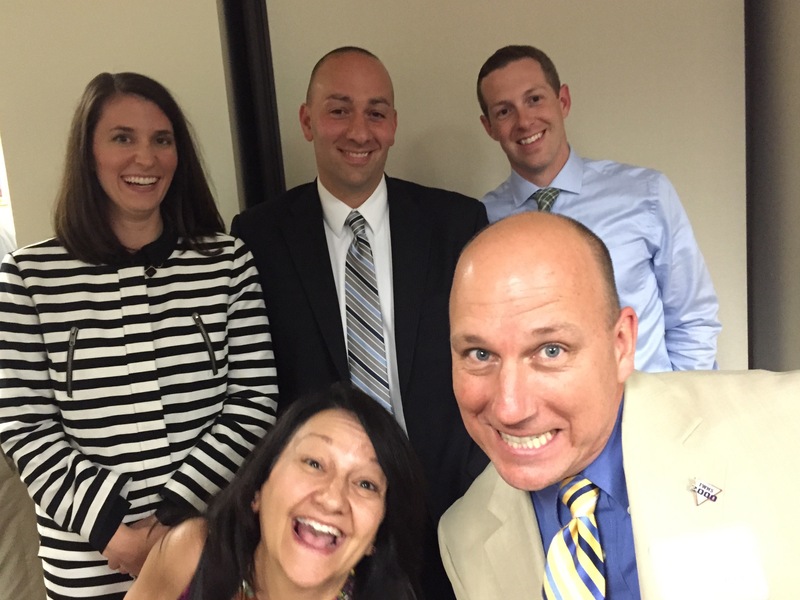 2015 – 2016 is going to be a great school year in Worthington! School begins August 19th. If you’re beginning to get ready please check “The Top Ten Things You Need to Know for Back to School” and the calendar of back to school events. In addition as we begin a new school year here’s some of what you can expect…. On August 19th the Worthington Academy will open in the Phoenix Middle School building. Worthington Academy is an individualized learning program using computer aided blended learning and personal relationships with teachers on site to provide high school students with an option for learning outside the traditional setting. We expect 120 students to be enrolled at the Academy by January of 2016. Also new this year at our high schools is the College Credit Plus pathway with Columbus State. Juniors and Seniors at each school can take Columbus State Courses on Worthington’s campus. These college level courses such as Composition 1 and 2, Intro to Psychology, Intro to Sociology, and Intro to Government and Intro to Programming Logic will transfer to any public university in Ohio and will provide our students a leg up on college and a reduced overall cost for college completion. As I begin as Superintendent we’re committed to undertaking a comprehensive evaluation of the current state of the district including enrollment; programming; staffing; facilities. We’ve partnered with the Ohio School Facilities Commission in order to make this happen beginning with the start of school. This fall we’ll engage our community in a process to create new mission and vision statements for Worthington Schools that provide a filtering mechanism for future decisions. In teaching and learning we will be focusing on maximizing academic potential for each student by increasing the number of students who take challenging coursework such as AP, IB, CC+, Honors Courses and decreasing number of students earning D’s and F’s in any courses. Our goal is to help every child grow from where they are and to make certain our students graduate from Worthington Schools College and Career Ready and remediation free. This month we launched our new website template. We are updating the website to ensure that our site is current, engaging, more visual and is accessible on any device (responsive design). That is what is expected from users today. Our hope is that our stakeholders find the site easy to use whenever and wherever they need it. Also, the new site will feature a Google search function which should make finding information easier than ever. In addition we’ll continue to expand our social media integration and presence with facebook, twitter, blogs, etc… We want to connect with our community where they are. Finally our central office administration has been restructured. Randy Banks begins as Assistant Superintendent with a focus on the operations of the school district. Jennifer Wene becomes the Chief Academic Officer and she will coordinate all aspects of the academic program. Our elementary schools will be lead by new Director of Elementary Education, Patrick Callaghan and our secondary schools will be lead by new Director of Secondary Education, Dr. Neil Gupta. We were able to create our new structure by eliminating several positions from last year. We believe our new structure will provide better alignment of our schools while increasing the support for our principals, teachers and students. At the building level we have new principals in place at Wilson Hill Elementary (Dan Girard), Brookside Elementary (Jenny Wielinski) and Worthington Estates Elementary (Rob Messenheimer). With all of the exciting things happening in Worthington Schools this year we will continue our commitment to lean operations. We’ll work to operate on the cutting edge when it comes to operational efficiencies and innovative budgeting practices. In 2012 we passed an operating levy and bond issue and promised the community it would last three years. We begin year four this year and are now certain we will be able to stretch the 2012 levy at least five years. On Tuesday I stopped by our transportation department just to check in. When I arrived Mr. Sontag our Director of Transportation was not available. He was out in the parking lot working with a family on one of our buses. As I climbed the three steps up to the bus I saw Simeon, a three year old student who will begin at Sutter Park this fall, learning to use his harness. Simeon has Spina Bifida and thus he does not have the use of his legs. His harness will keep him upright and safe on his bus ride to and from school. Like many three year old boys Simeon was excited to be on the bus. Now, I must admit he was frustrated that the bus was not moving and he kept asking them to “go, go.” Simeon’s mom and sister were with him and everyone was pleased when it was determined the harness would work and we had a plan in place for the coming school year. Well, that’s not totally accurate. Simeon was not pleased at all when he learned that the bus would not be going, and even worse it was time to get off. He voiced his displeasure and as someone with three kids of my own, I silently smiled. As we prepare for a great school year in Worthington our transportation department is working diligently to make sure bus routes across the 19 square miles of Worthington Schools are established, drive times are mapped out, traffic at 23 and 270 is accounted for, and sports teams get to their many August events. They’re working diligently to troubleshoot for individual families like Simeon’s and striving to provide what is necessary to safely transport all students to and from school. Did you know that on average 5,400 students ride a Worthington School bus to and from school each and every day? This does not account for the students who walk or are driven to and from school but ride a Worthington bus for co-curriculars and field trips. Did you know that in addition to transporting students to our own 19 school buildings our transportation department transports students daily to 15 private schools, 4 charter schools and close to 15 special needs placements outside of Worthington? 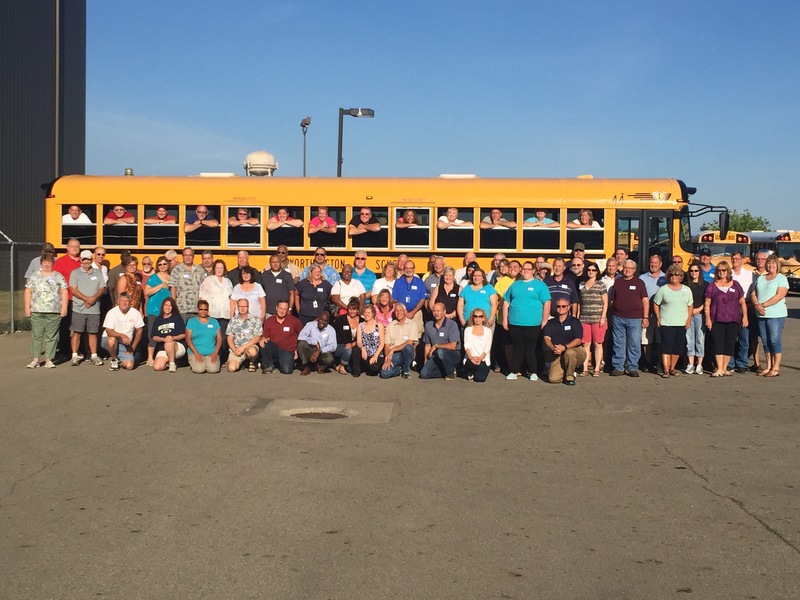 Did you know that the Worthington School District has a bus fleet of 85 yellow buses? A new school bus costs almost $90,000 per bus and even with the depreciation cycle our Worthington Schools bus fleet is worth around $4.25 million dollars. Did you know that last year Worthington School buses transported students close to 980,000 miles? You read that correctly, 980,000 miles! We average 5,045 miles per day in daily routes with field trips adding additional mileage. Did you know that our first bus leaves the transportation garage by 6:15 A.M. every morning of the school year and the last bus pulls in on average around 10:15 P.M.? Sometimes trips such as away football games cause the last bus to come in close to midnight. Thus, our transportation department operates 18 hours each and every day. Did you know that Worthington had school buses on the road this year every single week of the year except for the week of July 4th? Even this summer, in addition to summer trips, we had six buses completing daily routes to take students to and from our summer reading camp. Our transportation director, George Sontag often says we can train anyone to drive a school bus but it takes someone very special to be a Worthington School Bus Driver. It takes a person that connects with students by learning their names and listening to their needs. It takes a person that communicates their expectations and meets one on one with students to change behavior. It takes someone who cares about about children, your children, when they are on your bus. It takes someone who is a good leader; someone who leads by example. And finally it requires a person who has safety first on their mind regardless of what happened at home this morning or the weather outside. Our transportation department is ready for another great school year. There’s a million miles in front of them! Way back in 1999 when I wanted to order a pizza from Villa Nova I would go to the kitchen cabinet and get out the 5 pound yellow book that we called the “Yellow Pages.” Inside this book I would find the telephone number for the Villa Nova and I would make the call. Once I made the call I would have to ask about specials, prices, etc… because none of that information was available to me. My kids have never seen the “Yellow Pages.” When they want something they just type the name into Google or ask Siri for it. All of the information they seek is expected to be available online. And, so it is with public school districts. Thus, in order to serve our diverse Worthington K-12 community and our potential new families, we’re updating our website to make it more mobile. A responsive website design should optimize the experience for our community. Our belief is that a mobile friendly website will lead to increased traffic on our site, repeat visits, and continued community support for our great district. We’ve been working diligently to improve our website for the past few months, but this week we will post a new main page and enhanced department pages with more social media integration, large vivid photographs, and a more user-friendly page design. We want the website to be the front porch of our school district. As those unfamiliar with our school district check out the site, we want to make certain they leave with a positive first impression. For our parents and community members, we want to make certain the information needed is available and easy to find. Our new website will be more responsive and very visual. Visitors to the website already see enhanced pages compared to the old website. The current main page now has Quick Links on the left (including this blog), a center column with revolving photos of feature stories, and a Twitter column on the right, with links to the district’s Facebook page. 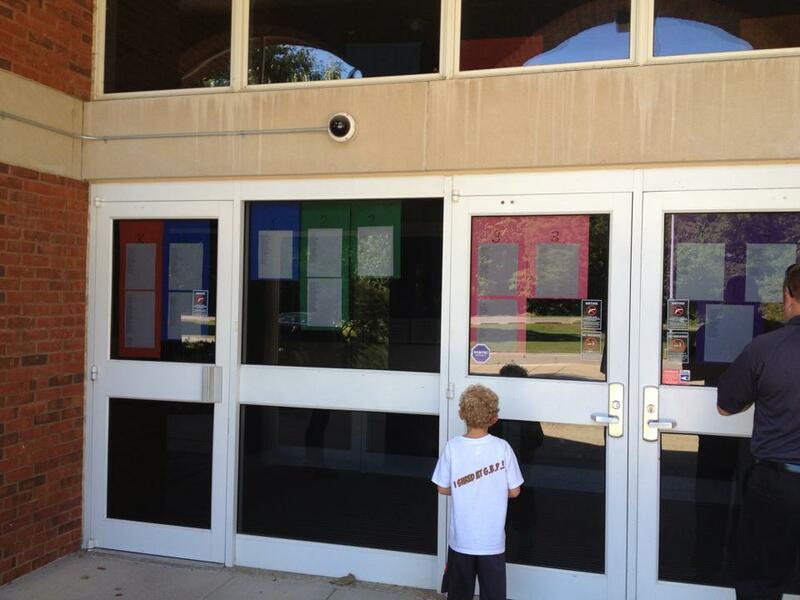 More changes are arriving in upcoming weeks and those changes will continue throughout the school year. They will include wider center photo images on the front page that lead to feature stories, two columns with larger information tabs, and enhanced social media and upcoming event sections. Our intent is to use the main photo image as our major information source. When you click on the picture you will get a story and find out why we are featuring that story. In addition, a major goal of our redesign was to launch a site that can be accessed on any device. The old one did not work well on smartphones and tablets and we needed a better search function. Our new site should accomplish both functions and utilize a very simple, yet effective Google search function. Soon you’ll see more videos embedded in the website as well as the ability to live stream board of education meetings. As with anything, our web presence is a work in progress. We will roll out new pages this week and everyday we will work to make it a little bit better. 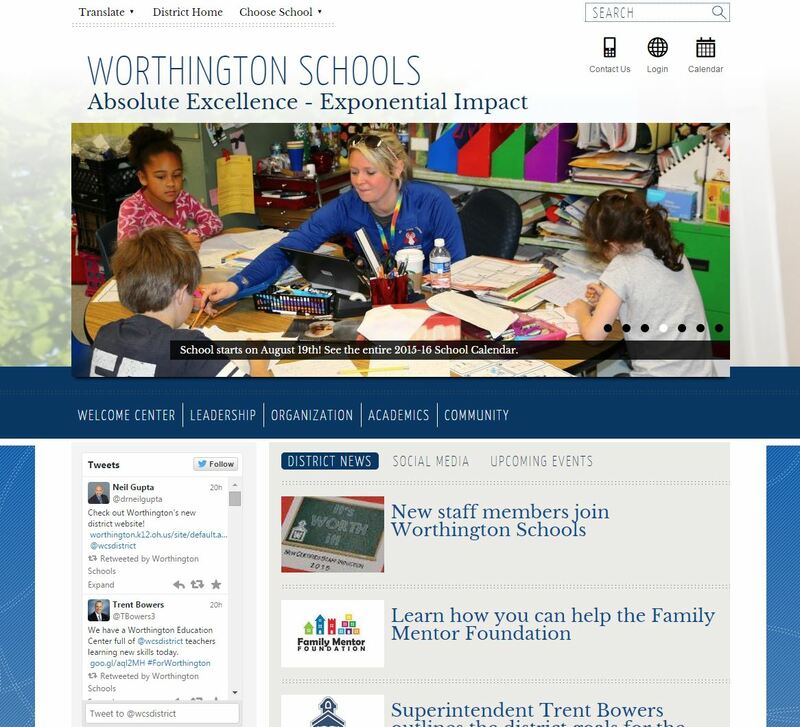 Please spend some time with our new site at http://www.worthington.k12.oh.us. We’re not rolling out a finished product but instead a glimpse at where we intend to go. We’re open to your feedback as a user. Our Communication Specialist Don Taylor can be reached at dtaylor@wscloud.org.